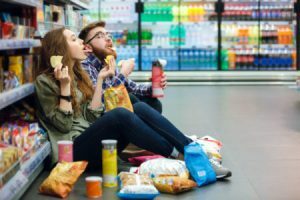 New research by the University of Melbourne and Cancer Council Victoria, published in NeuroImage: Clinical in 2018 suggested that graphic warnings on junk food packaging would prove an effective deterrent to consumers when deciding what to eat by making people consider the health implications of their choices. But is this true? The fundamental cause of obesity and overweight is an energy imbalance between calories consumed and calories expended. Therefore, preventing overweight and obesity means making the conscious choice to eat healthier foods and get regular physical activity. The problem is, the advertising and marketing of junk food products are ubiquitous in the world. We are surrounded by visual cues of food images that trigger anticipated taste and enjoyment sensations that work on us at the subconscious level, creating impulsive hedonistic responses to foods. In a study done in France and published in 2018, scientists defined junk foods as “ultra-processed” such as muffins, chips, candy, sodas, frozen dinners like meat balls and fish sticks, instant ramen noodles, sugary cereals, and items that are cheap and come in a ready-to-go packet or container at the store. The researchers estimated that these types of food accounted for 25 to 50% of total daily energy intake of people who live in rich developed countries like the US, France, and Canada. So what can be done about the amount of junk foods in the world and our ability to resist them? In the University of Melbourne study referred to earlier in this blog, 95 hungry participants were shown color photographs of 50 different possible snack foods — chips, chocolate bars, biscuits, nuts, but also fruits and vegetables. Participants were asked to rate how much they would like to eat each food at the end of the session. They were then shown health warnings with and without the images. The results showed that negative text combined with images was twice as effective at changing people’s eating choices than messages that had only negative text or even images combined with positive text. The investigators therefore concluded that warning labels with images would prompt people to exercise more self-control based on negative health implications rather than on enjoyment of eating a particular food. In my view, it remains an open question as to whether the conclusions based on studies done in a controlled environment are applicable to people in outside living conditions. 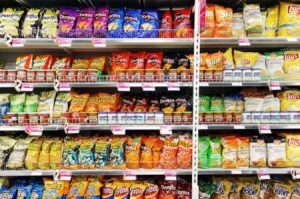 When faced with a real package of junk food at the grocery store rather than just a photo of it, would people actually refrain from buying it? Because people often have associated the taste of the junk food with a prior experience in their life, such as in childhood or an enjoyable time with friends, their ability to refrain from purchasing the item despite any warning might simply not be strong enough. In addition, it is hard to imagine that food companies or governments will begin posting such negative warning labels on junk foods as many countries now do with cigarettes. Let us be honest, if you saw such warning labels, would you take them seriously and reconsider the product as junk food and refrain from buying it? Regardless, here’s what I suggest you do and why. In the current way of eating, increased energy intake from grain and grain-based foods are the driving force behind being overweight or obese. Therefore, my recommendation to you is to think of anything made with grain and grain-flour—whether refined or whole grain—as unnecessary food in your body. While a small amount now and then will not harm you, the fact is, no carbohydrate is an essential nutrient for humans. 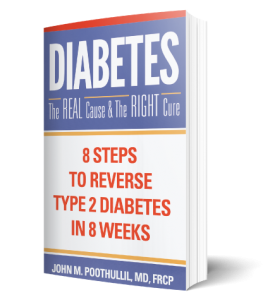 The more grains and grain products you eat, the more likely you will gain weight and possibly develop diabetes. Try going grain free for one week—no bread, pasta, pizza, rice, noodles, flat bread, rolls, sweets or snacks made with a lot of grain flour, etc., – and see for yourself how you will lose some weight and feel better.